We had another busy fun filled weekend this past weekend! Saturday Pete and I were out at Run into the Wild, with our booth set up to meet new potential trail runners. We had a great time, and met a lot of great people, and saw some friends too. A few of our members battled the elements. Congratulations to our Trail Tales Members- Keri, Elizabeth and John! The conditions were wet and muddy for our runners. A little mud will not hold our runners down! :) Just fyi... Did you know if you stick around at many trail races there is a raffle at the end? Some runner won a Jagermeister machine! I am SO jealous. Other prizes included Gift Certificates to REI etc...and Corrinne donated some buff's n cuff's. 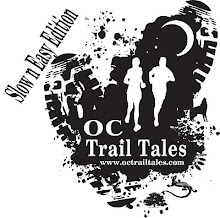 Allison, the Race Director informed us that there will be a summer trail race series with a concert at the end... how cool will that be :) more details will follow. That will be a fun one to participate in and bring the family too. El Moro meeting place at Coastal Peak Park is at the corner of Ridge Park Road and East Coastal Peak. Taking the 73 toll road exit Newport Coast Drive making a left until you hit Ridge Park Road. Turn left on Ridge Park Road and follow it up the long hill until you reach East Coastal Peak. We have some really great trails, race directors and races coming up. Cant afford them all?? Check this out! Interested in earning a FREE entry to XTERRA Black Mountain on April 10, 2011? Come out and volunteer this weekend,either Friday, April 1st or Saturday, April 2nd, at the ACT! Today run Benefitting Military families, and we will in turn comp your entry to Black Mountain! We need FIVE volunteers for packet pick up on Friday, April 2nd from 3-7:30pm, and FIVE on Saturday morning at the race from 5am to 11am. Duties will range from registration, race set up, VIP's, expo...just come ready to have fun and help a great cause! For more about the ACT! Today event, check out http://acttodayformilitaryfamilies.kintera.org! To VOLUNTEER and earn your XTERRA entry, please email Detra@genericevents.com for more information. First FIVE people to volunteer for each shift get a free entry...first come, first serve, so don't delay!! Just a quick reminder for Run into the Wild trail race on Saturday. You can still sign-up and register at these locations. Another fun filled running weekend! We explored some new trails due to the rain on Saturday with the Chili Group. Got a bit lost and ended up on a game trail, but recovered and found our way back to where we need to be. A little initiation for our new member Lisa! :) You guys did awesome! This weekend is Into The Wild in Irvine Regional Park. The 10k starts at 7:30, and the 21k starts at 7am. Please give yourselves enough time to get there, and get your packet pickup and be ready. Remember, we will have a booth, so you can find us easily and keep your stuff there as well. Let me know if we can have anything else there that you need. What a fun filled weekend we had this weekend. We started out with the OC Chili Race on Saturday morning. Having our own tent there was definatley fun, and what I would like to do at the races so you can all have a spot to come too. :) It was great to see everyone, and in such great spirits! So, if you haven't looked...here are the results! Lauren...we are so sorry you fell honey bun. You were right behind us, and then i thought you were just taking a break. :( we didn't know you fell, or we would have come back for you. I hope that you are feeling better, and your ankle is all healed up! For Chili Group this coming weekend, same meeting spot at 9am in O'neill. I am looking forward to seeing you! If there is rain lets meet at the bagel shop at 9am.. lets keep our fingers crossed. Leona! Wow, you guys are doing a great job! Everyone is so strong, and look fantastic! Donna, you are doing SO awesome! Very strong! You are Rockin' it! Yolanda, you are one tough (girl scout) cookie! You are a great runner, and i want it to stay that way, so please, please, lets talk about your achillis tendonitis this week! I hope you are feeling better. Tom, we missed you, and can't wait to hear all about your 50k! I really would like everyone in both groups to get to their goal race/races, injury free! I am so excited for all of you, and it is such hard work that you are putting in, time and effort. I want you all to know how proud we are of everyone for their time and effort that you are putting in for yourselves. Great Job! It is not easy with families, work, and life itself, so my hat goes off to each of you. Leona group meeting spot this weekend...TBD depending on the Rain- :) MUAH!! We started out Saturday with the Chili group and some old friends! We had fun starting the morning running through the water, and running the Chili race course. I saw lot's of activity... people riding their bikes, hiking, and lots of buzz! It was really nice being out there in the warm weather. Everyone did a great job! For Chili Group this weekend, we have the actual race! We will have a Pop-Up tent down at the start/finish that you can bring your stuff and leave it there while you go out on your run. We will be there early, so feel free to come whenever! Leona Group...Thank you so much for making my first run back on Sunday fun and bringing great weather! You were all so awesome, and stayed right on your target time! Everyone is going to do great! I cant wait! It is so awesome to run again! I have to say, I really enjoyed the run this past weekend since I have missed so much! I cant wait until we meet again this weekend! I was really happy to see our friends running the Rocky Road 100 Mile race in Coto De Caza. Our friend that we ran into Eric, finished his 100 Mile adventure in under 31 hours! Yeah!! One of these days, that too could be you! The Leona Group had a fun filled adventure Sunday running 25-30 plus miles out at Lake Hughes. We started by meeting in Brea at 4:50am and driving to Lake Hughes for a 7am start. It was only 28 degrees at the start but as the day went on it did become warmer. Both Donna and Tom did fantastic... the run was very scenic and we were blessed with some snow :) the single track sections had a few inches of snow which made the run even more enjoyable... it really felt like Christmas. Tom did get a little confused on the run and made a wrong turn and ended 8 miles away from the car. Luckily he ran into some other runners who offered him a ride back to his car. We have a Birthday to celebrate this week...Happy Birthday Tom! I am also looking forward to my first trail run on Sunday with the Leona group! We will meet at Ridgepark to run El Moro. I cant wait! It seems like forever that I have been grounded! The game plan for El Moro- Let's meet at 5:50am and start our 20 mile adventure at 6:00am Sharp! This will be a timed run with 2 loops (you should allow yourself 2:15-2:25 to complete each loop). We will track your start and finish time and how long you fumble at the car for the second loop... you should plan to be zip zip... We will provide Aid Station support at the car to get you out and going... We will provide maps prior to the run, and please carry your cell phone.